For Belk and Ann Bacot Daughtridge, there is no place quite like their beloved home of Charleston. And as their city continues to flourish, the Daughtridges are deeply committed to ensuring that Charleston's intellectual and artistic pursuits also thrive. Belk first came to value the College through his support of athletics programs and scholarships. A former member of the Cougar Club Board and School of Business Board of Governors, Belk, his sister and father, created The Daughtridge Family Endowed Athletics Scholarship in 2003. From there, he discovered the rich cultural terrain that distinguishes this campus and that has the power to transform a great city into a greater society. 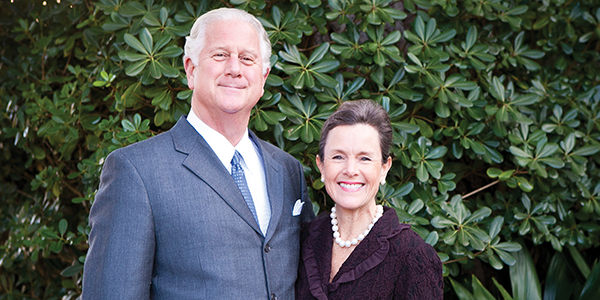 In 2015, Belk and Ann Bacot established their planned gift to the College that can help elevate their city for many years to come. The Daughtridge's planned gift will support a faculty excellence endowed fund and add to the family's endowed athletics scholarship. The Daughtridges are devoted to Charleston and the College---today and tomorrow. With their planned gift, they are planting the seeds of knowledge to nourish both for generations to come.